BANGKOK: Deputy Finance Minister Wisudhi Srisuphan has hailed the bill on land and buildings tax, which is on the verge of sailing through the National Legislative Assembly (NLA), as a significant overhaul of the tax structure. Mr Wisudhi said that once the bill becomes law, it will help boost effective use of land and inject more money into local administrative organisations (LAOs) for local development. The much-awaited 94-section bill was deliberated by the NLA yesterday (Nov 15). It is expected to be voted on by lawmakers today during the second and third readings. The land and buildings tax will replace the house and land tax and the local development tax, which have drawn criticism for being outdated. Except for the tax collection element, the bill, which was drafted by the NLA’s standing committee, chaired by Mr Wisudhi, will reportedly be enforced immediately upon its publication in the Royal Gazette. The tax collection will come into force on Jan 1, 2020. Speaking before legislators, Mr Wisudhi said the existing land tax law has been in force for a long time and efforts should be made to usher in the new legislation that draws in progressive taxation, as opposed to the regressive type that is in place today. It is important to reform the structure of land tax to make it fall in line with the international standard, he said. “This would stimulate the use of the land and enhance the efficiency of tax collection by local administrative organisations and help local bodies establish sufficient budgets to develop their areas,” said Mr Wisudhi. According to the bill, land used for agricultural purposes with appraisal prices of up to B75 million will be taxed at a rate of 0.01%, those between B75-100 million will be taxed at 0.03%, between B100-500mn at 0.05%, between B500-1 billion at 0.07% and land with appraisal prices of more than B1bn will be taxed at a rate of 0.1%. Mr Wisudhi said the new bill would allow most farmers to pay less tax in comparison to their current obligations. Their tax will be waived during the first three years, he said. Juristic persons who capitalise on a large swathe of farmland would be obliged to pay a higher tax, he said, stressing the collection of their tax would start in the first year of the law’s enforcement. 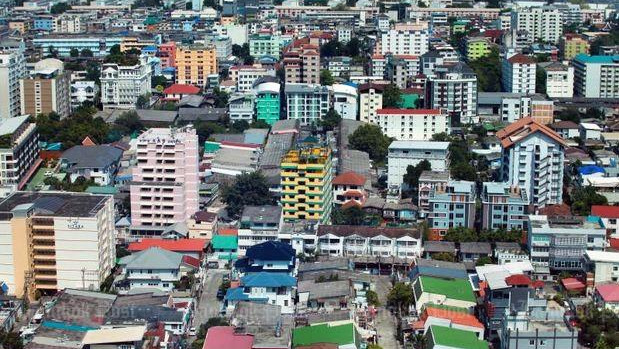 He said owners of first homes valued up to B50mn would be exempt from the tax. Those who own several homes will face more tax burdens, while people who engage in a long-lease contract of properties would face eased tax obligations. Tax obligations shouldered by most of the small- and medium-sized enterprises would remain relatively similar to what they were before, he said, adding that big business operators who have properties with high values would have to face heightened tax rates. Meanwhile, tax alleviation will be applied to operators of businesses that concern public services, such as private schools, according to Mr Wisudhi. The deputy finance minister said those who have undeveloped land would face stiffened taxes, which would stimulate them to make use of it. “This could reduce the problem of land price speculations,” said Mr Wisudhi, adding the measures would give landless people more chances to purchase land. According to Mr Wisudhi, the appraisal prices of land and buildings would climb in the future and the LAOs are expected to receive more tax revenue. 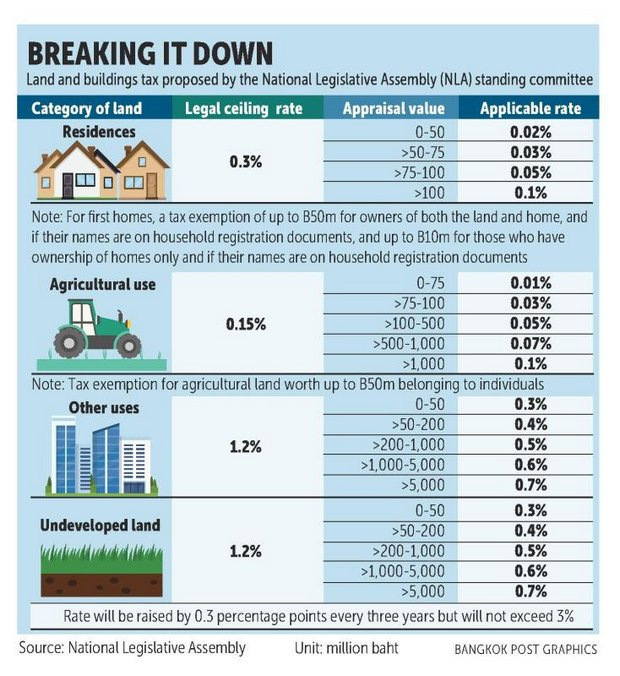 Meanwhile, several lawmakers argued over the ceiling tax rates applied to land and buildings in association with homes (0.3%), agricultural use (0.15%), commercial purposes (1.2%) and undeveloped land (1.2%), saying the rates are not suitable. Worapol Sokatiyanurak, an NLA member, said the rates do not comply with the current economic conditions and would burden people. He said the ceiling tax rates for land used for agriculture and commercial purposes should be at 0.1%. Rates for land used for residences could be lowered to 0.2% and for undeveloped land could be increased to 2%, he said. The higher tax ceiling for underdeveloped land is aimed at forcing owners to make use of the land, Mr Worapol said. Pornchai Thirawet, financial adviser of the Finance Ministry’s Fiscal Policy Office, said the bill, if approved by the NLA, will be submitted to HM The King for endorsement and then published in the Royal Gazette. After the laws are issued, the LAOs will be informed within 30 days of land under their jurisdictions by the Department of Lands. After that, the LAOs are obliged to survey the land for classification, Mr Pornchai added. According to the bill, land includes mountains and waterways, while buildings are defined as structures where people can reside, keep goods or carry out industrial or commercial businesses. Land used for agricultural purposes includes areas where people farm and raise livestock.